Motorola’s latest android based tablet, Droid Xyboard is now out for sale in US market that too with free shipping on Motorola official website. Motorola Xyboard is available in two variants, 8.2-inch and 10.1-inch display sizes ,which are further available in 16 GB and 32GB models respectively. Motorola tagged the price for 16GB and 32 GB of 8.2 ” display variant at $399.99 and $499.99 respectively. The 10.1 ” display variant will cost around $100 more than the former one i.e $499.99 and $599.99 more for the similar storage capacities. 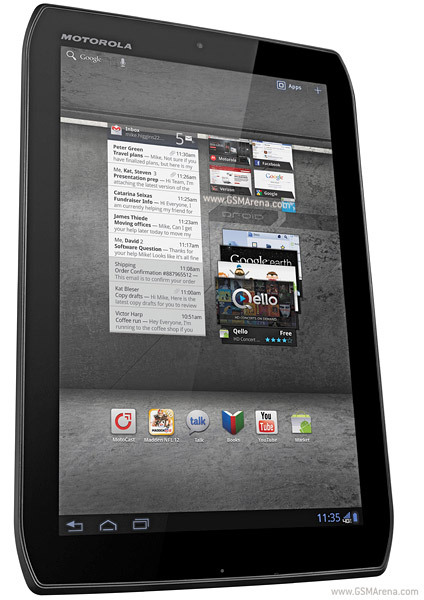 This latest tablet from Motorola is also called as Xoom 2 in the UK and comes with design much enhanced than the Motorola Xoom. The Motorola Xyboard is powered with Android 3.2 Honeycomb though nothing to worry about the fact as Motorola has already announced Android 4.0 Ice Cream Sandwich update for the tablet. Motorola Xyboard features HD-IPS LCD capacitive touchscreen with 800×1280 pixels resolution and Corning Gorilla glass. The highly advanced display delivers crispy and vivid viewing experience for the users. The Xyboard is powered with 1.2 GHz Dual-Core Cortex A9 processor,1 GB RAM and PowerVR SGX540, all embedded in TI OMAP 4430 chipset to deliver high performance. The sensors like Accelerometer, gyroscope, compass, barometer etc will definitely make it a good gaming platform for the casual gamers for sure. Motorola Xyboard features 5 MP camera with autofocus, LED flash,Geo-tagging and capable of video recording at 720p@30fps. A secondary 1.3 MP camera is also packed with the tabet. With Moto E And Moto G Motorola Mobility Has Adopted The Google Way Of Thinking! World’s First Mobile Phone Was Made By Motorola in 1973, Priced At $4000: Evolution Of Mobile Phones ! Did Google Inc. (GOOG) Play The Clever Fox By Selling Motorola To Lenovo?